This book is essential reading for any United States citizen who wants to understand our present system of choosing a President and a Vice-President, the dangers inherent in it, and what urgently needs to be done to improve it. 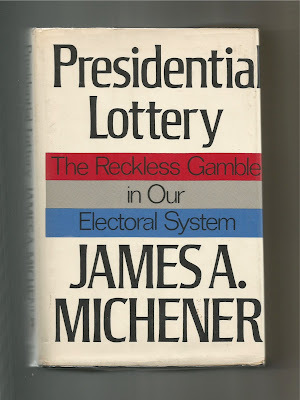 James Michener wrote this book in 1969 after serving as an elector of the Pennsylvania Electoral College for the 1968 Presidential election between Richard Nixon, Hubert Humphrey and George Wallace. Michener believed that Wallace would win the South and all its electoral votes. And if neither Nixon or Humphrey attained 270 electoral votes, the election would go to the House of Representatives. Or not. Wallace had other ideas. In what he called "a solemn covenant," Wallace intended to offer Nixon and Humphrey his electoral votes in exchange for certain concessions, one of which surely would be "abandonment of any type of civil rights legislation." But Michener had an alternative plan. If neither Nixon or Humphrey attained 270 electoral votes, and if Humphrey won Pennsylvania, he was going to suggest to the other Pennsylvania delegates that they vote for Nixon instead, thus hopefully enabling Nixon to attain the 270 votes needed. If, however, the Pennsylvania electoral votes weren't enough to make Nixon the President, the election would then have to go to the House. But Michener was going to talk the New York delegation into casting their votes for Nelson Rockefeller, making him the third candidate to be considered by the House instead of Wallace. And if necessary, Michener believed he could convince his Pennsylvania delegates to join the New York delegates in voting for Rockefeller. All these electoral concoctions, by the way, are perfectly legal under the Constitution. But they surely would have been challenged in the Supreme Court, thus delaying the selection of a President. As it was, Richard Nixon won the 1968 election with 309 electoral votes, and what might have been never did happen. But the fact that the electoral scenario could have happened so disturbed Michener that he researched the history of the Electoral System and wrote a book about it. The book, btw, was reprinted by the Dial Press, an affiliate of Penguin Random House, in 2014, 2015, and in 2016 before the last election. If you think the Electoral College maneuverings were a mess, the House system would have been a quagmire. The three candidates with the highest electoral votes would have moved to the House. And the House could have chosen anyone of the candidates to be the next President of the United States! Each of the 50 states had but one vote. And Michener points out a gross imbalance: Alaska, Nevada, Wyoming, and Vermont, with a total population of 1,467,000, according to 1968 estimates, would have four votes in choosing the President, and would outvote California, New York, and Pennsylvania, with a population of more than 49 million, but with only three votes (27). In his book, Michener tells us about the genesis of the Electoral System and some its flaws that became apparent as time went on. The system, according to Michener, was a compromise between large states and small states. One of the reasons the Founding Fathers had ruled out election solely by popular vote was because, as Eldridge Gerry of Massachusetts said, "The people are uninformed and would be led by a few designing men." There would still be a "popular vote," but the President would be elected, not by the total of the popular vote but by the vote of men in the electoral vote process who were knowledgable of the credentials of the candidates. Another reason (which Michener doesn't explicitly state in his book) that the Founding Fathers were against the popular vote was because smaller states were afraid that the larger states would elect their "favorite son." He concluded with a statement I have never forgotten. 'I believe totally in democracy but I want to see great crowds at the polls in only one condition. When they are filled with blind fury at the mismanagement of the country and are determined to throw the bastards out. For the rest of the time I think you leave politics to those of us who really care." I am surprised that this group of keen politicians and social philosophers should have failed to anticipate the two rocks on which their plan would founder. First, they did not foresee the rise of political parties or the way in which they would destroy the effectiveness of the electors. Second, they did not guess that the election by the House would work so poorly. This blindness on the part of the best leadership this nation has ever produced should give one pause if he thinks that in the next few years our current leadership will be able to come up with corrections that will end past abuses without introducing new. There could well be unforeseen weaknesses in our plans that would produce results just as unexpected as those which overtook the first great plan (72). Michener went on to say that "men of high principle" no longer met to decide who should lead the country. Instead, almost all of them voted the party line, with "winner take all." Michener noted that polls taken in the 1960s showed that the general public was in favor of direct popular voting: 1966-63%; 1967-65%; 1968, before the election-79%; 1968, after the election-81%. There were three times, prior to the publication of Michener's book, when a candidate won the popular vote, yet lost the election: 1824, 1876 and 1888. I will briefly address the 1876 election because it had the most radical effect on our nation. A divided Congress, with the House ruled by Democrats and the Senate by Republicans, could not agree on how to go about electing a President under these circumstances. So they created an Electoral Commission consisting of members of the House, the Senate, and the Supreme Court. To make a long story short, the Democrats bungled the proceedings and the Commission chose Hayes to be the next President of the United States. The House, however, which rightfully held its own election as per the Constitution, had declared Tilden to be the President, and was prepared to nullify the vote of the Electoral Commission. But a compromise was reached: Hayes would be recognized as the winner of the 1876 election. In return, he would end Reconstruction governments in South Carolina and Louisiana and federal troops would be removed from all parts of the South. This electoral compromise had a profound effect on the recent emancipation of the black population. Southern states were once again permitted to rule themselves. And the South rose again, with the Ku Klux Klan putting the black man back in his place, and glorifying the efforts of Confederate generals with monuments heralding their place in Southern Society. In his book, Michener offers four proposals on how to improve our electoral system: the Automatic Plan, the District Plan, the Proportional Plan, and the Direct Popular Vote. All four proposals would require approval of a constitutional amendment: two-thirds of the House and Senate, and ratification by three-fourths of the States. Under the Automatic Plan, the Electoral College would be abolished. The electoral votes would be counted the same as usual but would be sent directly to the Senate. Under several variations of the plan, House elections might be avoided. A candidate could win with 40% of the Electoral Vote under one plan, and in a run-off election in another. Under the District Plan, the Electoral College would be retained. The electoral votes would be awarded by the popular vote in each district. eg. If a state had 38 districts, there would be 38 separate district electoral votes and not a winner-take-all electoral vote. If no candidate obtained 270 electoral votes, a joint session of Congress would elect the winner from the three top candidates. All Congressional members would have one vote. Under the Proportional Plan, the Electoral College would be abolished. Electoral votes would be allocated, not by the winner-take-all system, but by allocating the proportional vote gained by each candidate. The winner would need 40% of the electoral votes, or a joint session of Congress would elect the winner from the top two candidates. Under the Direct Popular Vote, the Electoral College would be abolished, electoral votes would not be allocated, and election by the House would not be necessary. The winner would be the candidate who won the most popular votes cast in the entire nation. They must be abolished. They must be abolished now. They must be abolished before they wreck our democracy. Heaven help us. The Electoral College was never abolished. And the winner of the 2016 Presidential Election is wrecking our democracy. Donald J. Trump lost the popular vote by 2,865,075 votes, yet, by hook or by crook, he won the election because he had more electoral votes than Hillary Clinton. Recent events show that he is not "draining the swamp," or guiding our country through his great leadership–the greatest ever–in his opinion. Instead, he is making a mockery of the Presidency. Yes. Our Founding Fathers were wary of the majority choosing a "favorite son." But they were also wary of the actions of factions. By a faction, I understand a number of citizens, whether amounting to a majority or a minority of the whole, who are united and actuated by some common impulse of passion, or of interest, adverse to the rights of other citizens, or to the permanent or aggregate interests of the community. Trump's faction essentially hijacked the Republican Party. And by hook or by crook (Russian interference in our election, voter suppression, etc. ), it gained enough electoral votes to win the election. One by one, Trump is tossing President Obama's achievements for the good of mankind out the window. And he is mismanaging our government. If a faction consists of less than a majority, relief is supplied by the republican principle, which enables the majority to defeat the sinister views by regular vote. It may clog the administration, it may convulse the society, but it will be unable to execute and mask its violence under the forms of the Constitution. Unfortunately, the present forms of the Constitution has allowed a minority to exert its will over the majority, and to elect a President who clogs the administration with unqualified members of his administration, and who convulses the society every time he tweets. And that is the least of it! If Michener were alive today, he would say, "it is time to amend our Constitution." And he would add, "it is time to throw the bastards out!"